This tour was excellent, and for reasons that may have been related to a later start time 2 pm, we wound up with a private tour! They were also flexible about our return to Danang, so even though the guide stopped just after 5 p.m., we were able to enjoy the city for dinner and then return via Hoi An Express at 7:15. The guide was very informative and spoke the best English of any guide we've had in Vietnam. Hoi An is a definite don't miss venue. 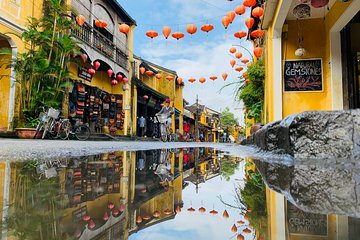 A must visit to Hoi An from Danang. Enjoyed the history and culture of Hoi An. The only downside is the hot weather in June. We were brought to some houses where there were guides explaining the history of the houses. It was not necessary to have the tour guide. We actually sent the guide home and did the tour ourselves the way we wanted. Outstanding. We really enjoyed this tour. Our guide was great - excellent English and very helpful. There was a good balance of touring and also time for us to visit a tailor that we wanted to go to. Whilst Hoi An is amazing and the tour interesting, we went back in our own time and at night. I recommend this to be a better way to see this amazing place - bit like Venice in that it is best done with a casual meander and not as part of a tour.